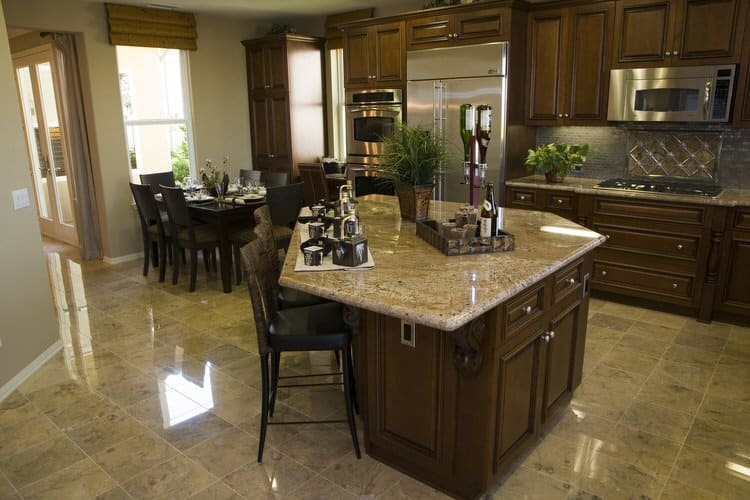 If the kitchen is the heart of the home, then a kitchen island is the heart of the kitchen. 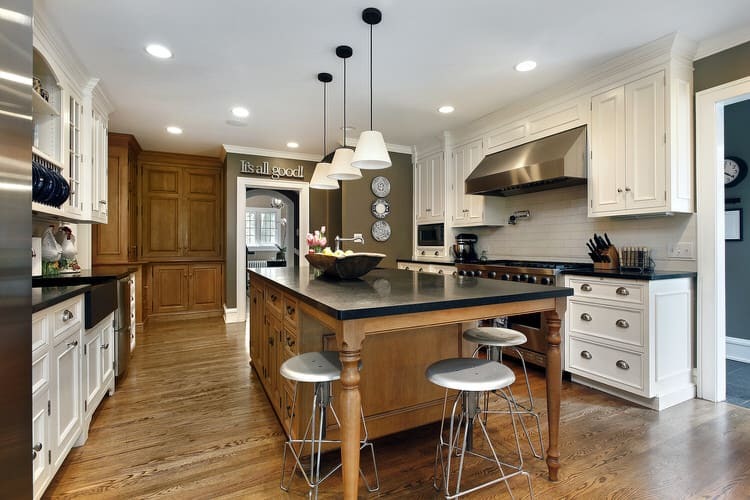 When surveyed, most homeowners rate a kitchen island as one of the most important elements in a new kitchen or kitchen renovation. This simple surface can completely transform the way you utilize and enjoy your kitchen—from helping the kids with their after-school homework to interacting with guests while you prepare dinner. 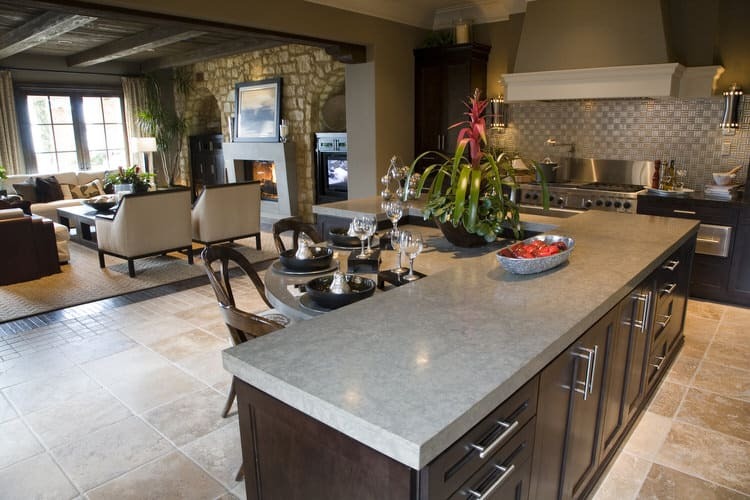 At its simplest, an island is additional space for food preparation and casual dining. At best, an island can house a sink, cooktop, appliances, cabinets or shelving to give you a big payoff in a relatively small footprint. Surely, one of these stunning islands would be the perfect addition to your kitchen! Dress things up with upholstered leather stools that contrast beautifully with the bright white of this Georgian-inspired island. Complete the effect with twin foyer-style pendants to shed plenty of light on the task at hand. Bigger is better for an island that doubles as a food prep area with an integrated sink and ample room for counter stools. When designing an island of this size, make sure you are totally in love with the surfacing material because you’ll be looking at it every day and living with it for a long time. We are into islands that use a combination of materials. This one features soapstone tile on the main work surface and a chunky wood slab for the raised counter. The metal and wood stools tuck neatly under the eating surface and out of the way of kitchen traffic. There’s no seating at this island—it’s strictly all about the work surface. The white enamel prep sink coordinates with the apron front farmhouse sink. 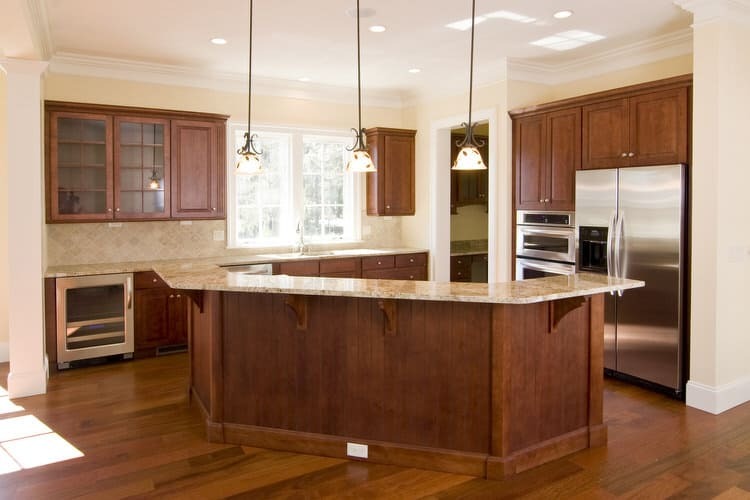 The island design and finish matches the rest of the kitchen cabinetry creating a cohesive and well functioning layout. This modern waterfall island is the ultimate in simplicity. No frills here. Just room for plenty of seating or food prep. The island looks substantial, but the composite construction makes it light enough to be easily moved. The linear iron chandelier above mimics its simple lines and provides a continuous band of light along the length of the island. A kitchen island is only as good as its ability to multipurpose. From storage galore to under counter drawers for cold storage, this custom island also houses an oversized single-basin sink and dishwasher. But wait, there’s more! 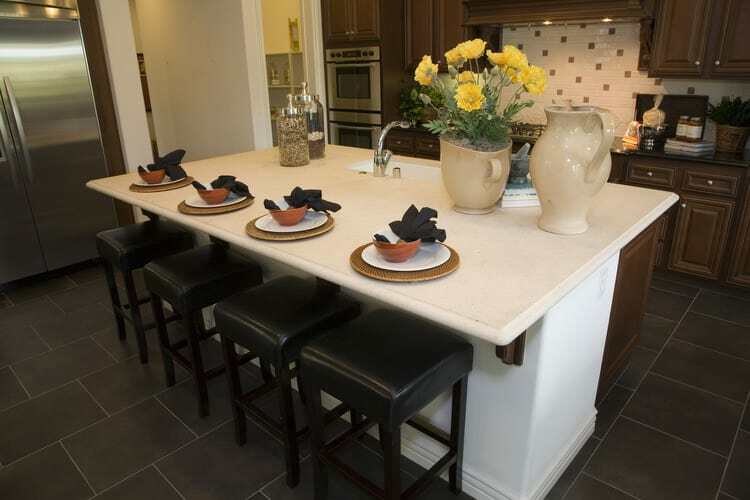 Pull up a few counter stools and you have the perfect place for a morning bagel and coffee. 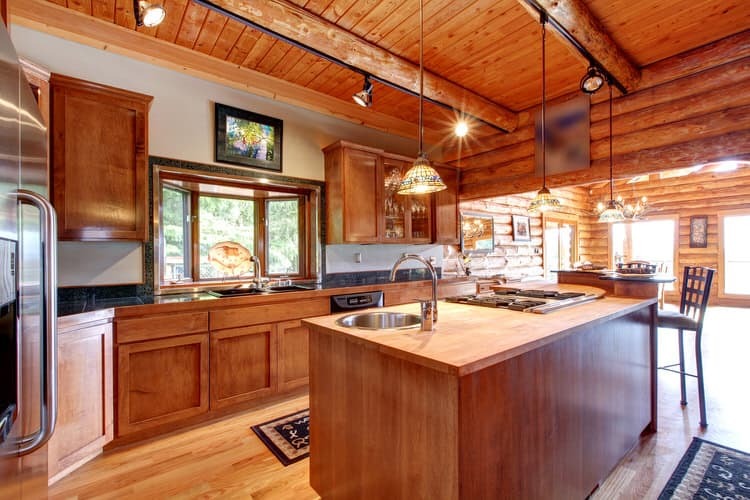 Even a luxurious log cabin in Aspen needs a kitchen island. You can prep dinner while watching the evening news on the flat screen above the sink. Traffic flow is no issue around this island. 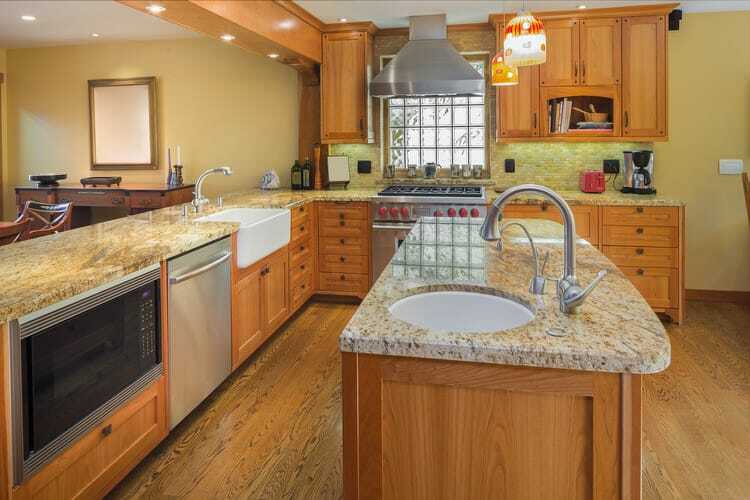 It is situated far enough away from the main counter to allow for a group of people to use the kitchen simultaneously. 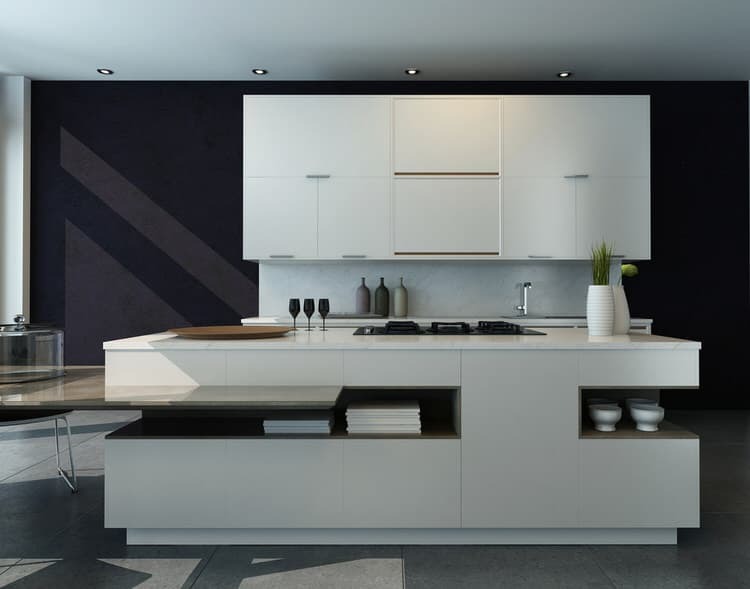 A high-end custom island is the centerpiece of this modern black-and-white kitchen. The cutouts create unique storage spaces for cookbooks and decorative accessories. The impressive furniture piece can also double as a serving sideboard for a buffet dinner. The homeowners searched high and low for a salvaged furniture piece to use as an island. A repurposed antique English millinery shop counter fit the bill perfectly. The open end offers room for industrial metal seating and the replacement soapstone surface looks like it belongs with the piece. The island in this roomy kitchen is not original to the space. It was recently purchased from a big box store and replaces the table now placed next to the windows. The new baby blue prep counter is on casters, so it can move around the room as needed. 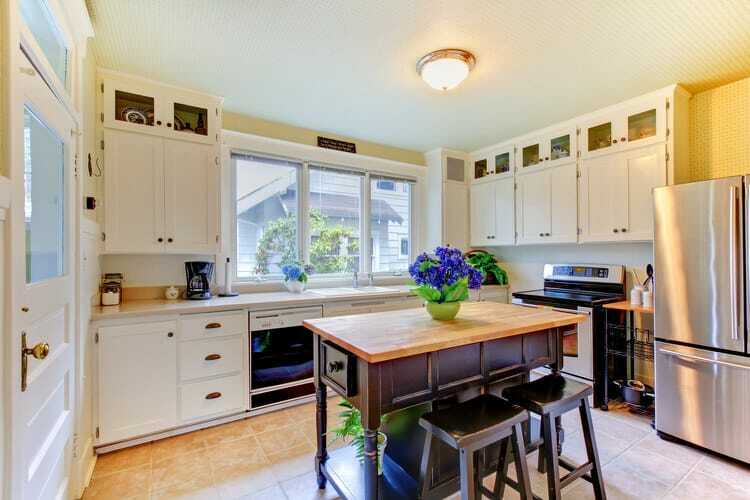 It has a built-in towel rack and easy-clean butcher block top. 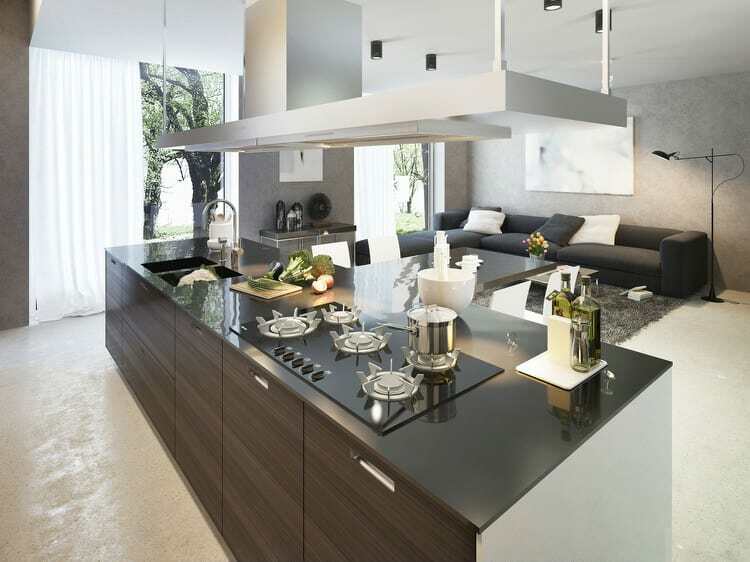 It’s really tempting to position your cooktop in a center island. 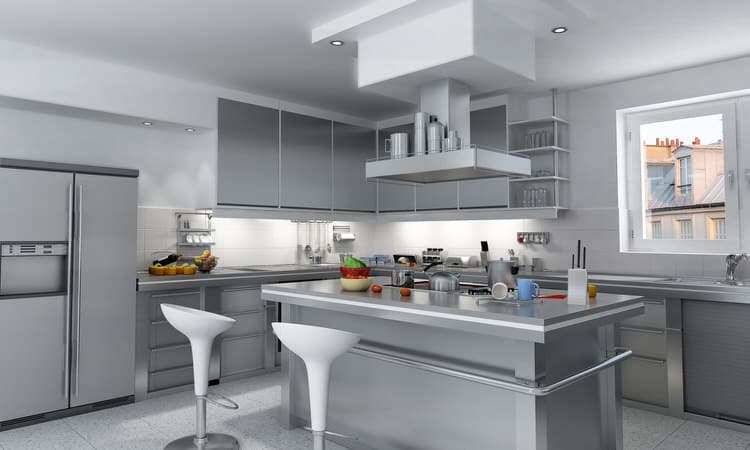 It gives you more upper cabinet capacity and allows you to store all of your pots and pans within the island. The only potential problem is the vent hood. In order to keep this room open, the homeowner opted for a retractable downdraft ventilation system. 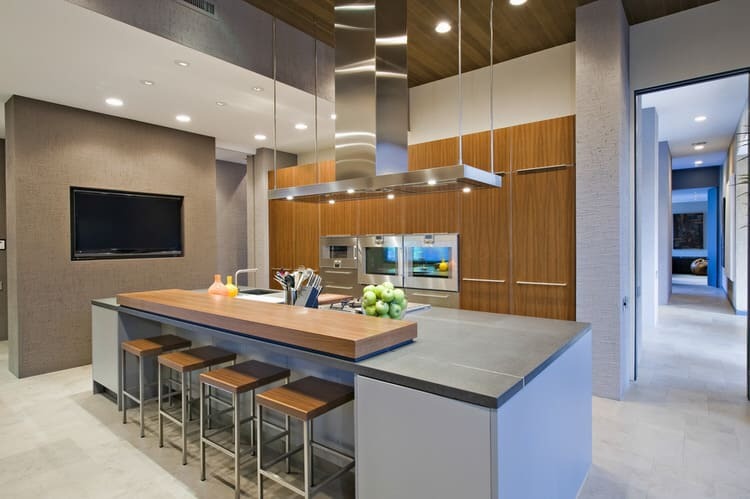 Here’s the scoop on this ultra-modern transformer-like kitchen island. It’s small, round and houses an induction cooktop, cabinets below and raised serving perch. Its partner, the curvy peninsula, is the primary workspace for this petite, red kitchen. The kitchen island offers room separation and a place for family and friends to congregate while chatting with the resident cook. 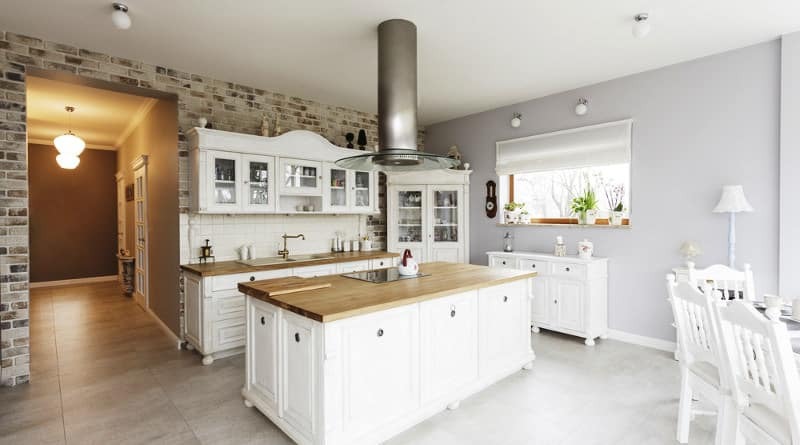 This kitchen is the perfect blend of workspace and gathering space. It is also a great setup for after school homework. We love the inviting color palette, furnishings and appliances. This little store-bought beauty comes with its own stools and has a couple of drawers and lower shelf for additional storage. You could install a couple of coat hooks on the other end to make a nifty dish towel caddy. Bigger is better. 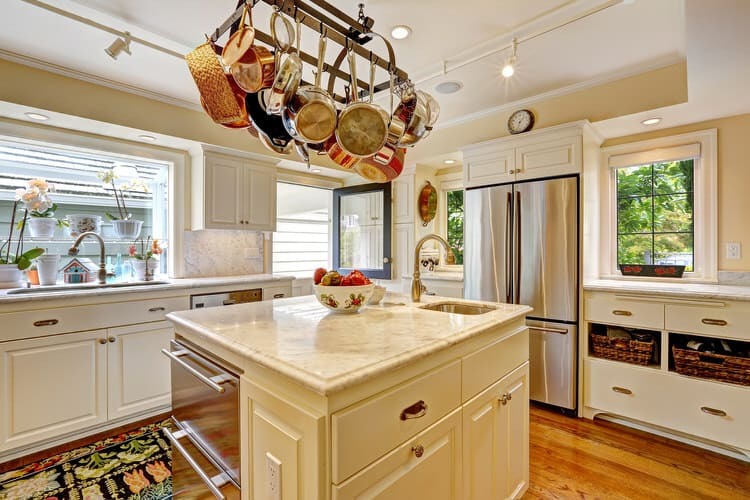 An oversized island in this Old World kitchen is a great place to stash seldom used kitchen appliances including the slow cooker, rice steamer, electric kettle, and so on. The large work surface is also a great place to display accessories, a cookbook collection or a fresh flower arrangement. 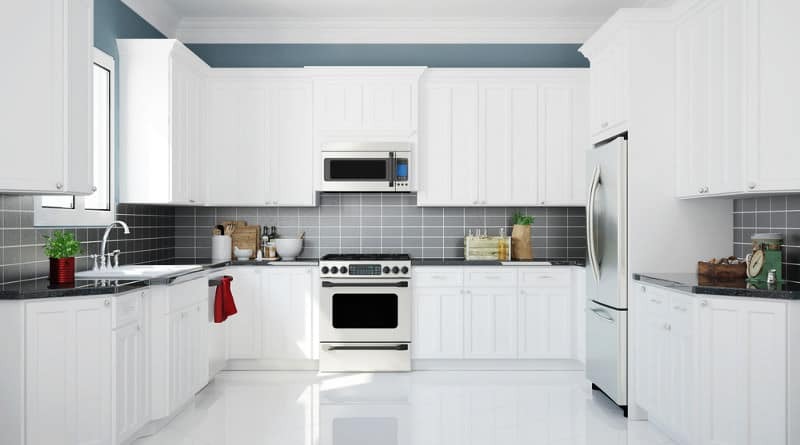 When microwaves are not integrated into cabinetry, they can take up way too much counter space. Easily solve that problem by tucking your microwave on a lower shelf of your kitchen island—just make sure it’s wired for electricity. An L-shaped kitchen island brings more workspace, storage and seating to the party. This one does it all with style. The drawers and cabinets run the length of both sections and the seating consists of a half-round, attached table situated in the crook of the L providing a place to seat two guests. The neat thing about putting a sink in a kitchen island is having the extra counter space to stack dishes or a place to rinse off your purchases from the local farmers’ market. Before you get all excited about installing a sink in your island, make sure you account for the cost of the plumbing and vent pipe installation. 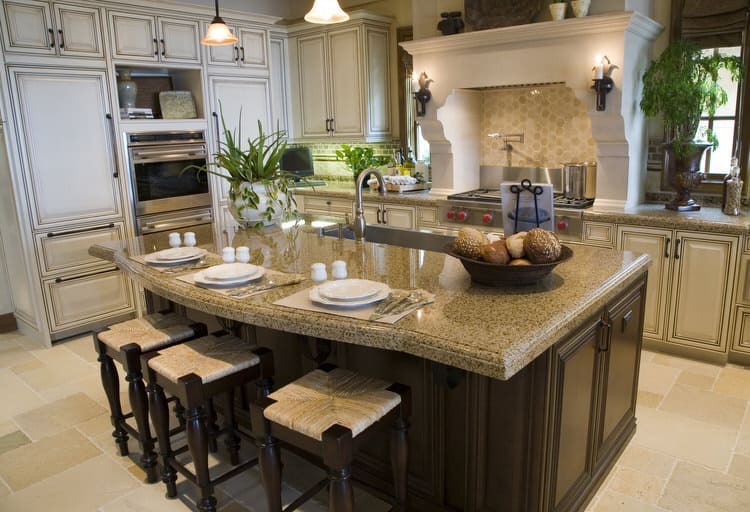 Multi level islands have been around for a while, but they are becoming increasingly popular. The elevated glass shelf on this island is a great surface for presenting a cheese tasting or offering guests a selection of delectable breakfast pastries. 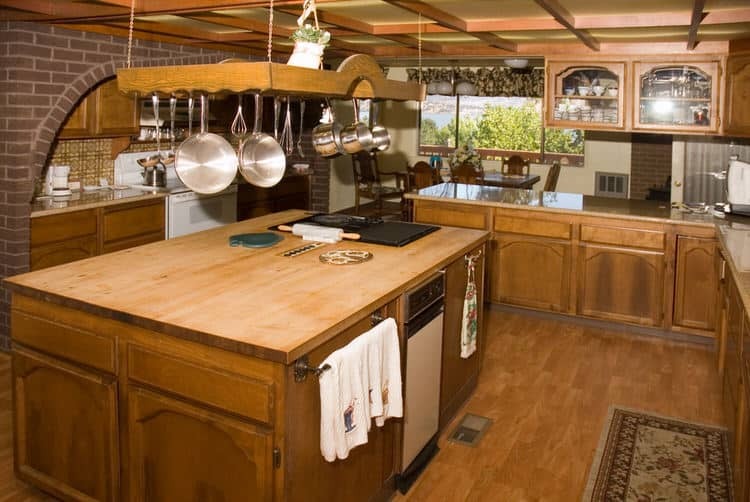 The owners of this estate situated on the rugged Oregon coast asked their builder to create a gigantic kitchen island. 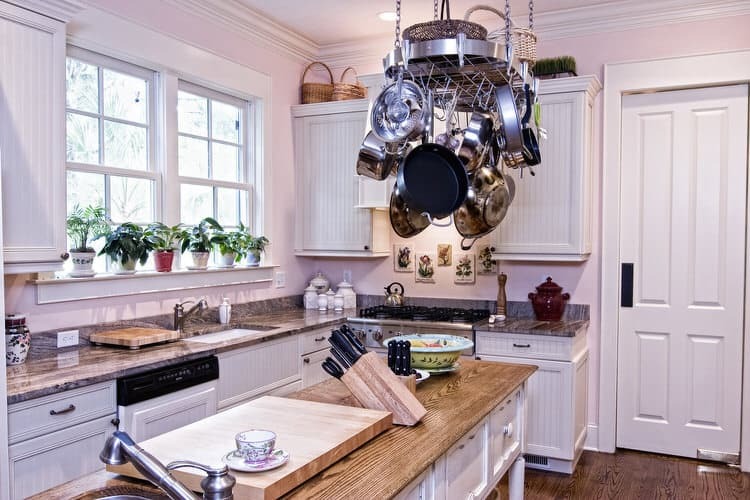 They wanted it to be home to the dishwasher, cooktop and to provide plenty of extra storage for their extensive collection of French cookware. The builder agreed to their proposed dimensions because of the ample space between the edge of the island and surrounding counters. 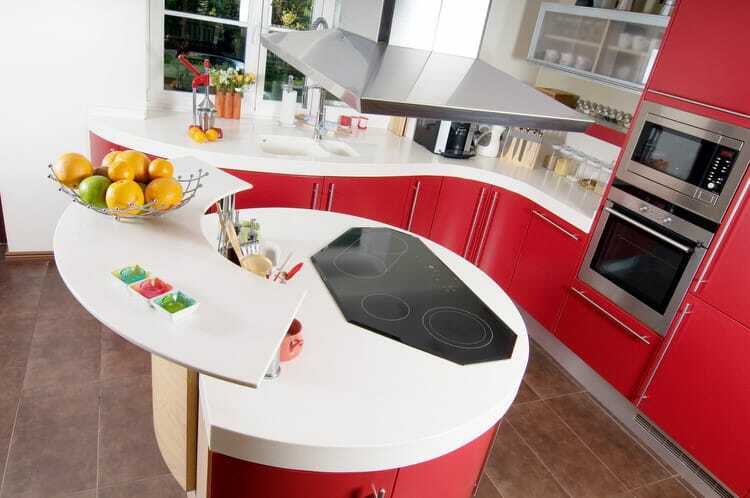 Give your island a personality of its own by making it a contrasting color. 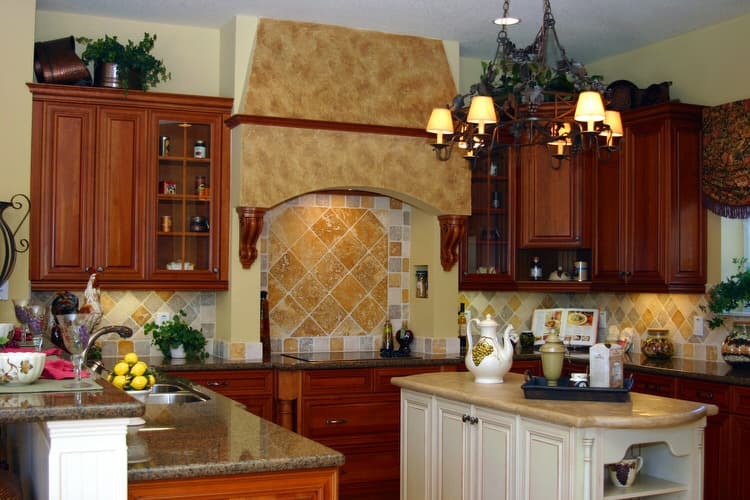 The cabinetry of this island matches that of the rest of the kitchen, but the butter yellow color makes it the focal point of the room. This small island packs a punch with refrigerated storage, a prep sink and several drawers and cabinets. The end shelves in this kitchen island are the perfect spot to keep your favorite cookbooks within easy reach and off the counters. The top is perfect for displaying decorative accessories or a collection of oil, vinegar and spices on a handy tray. Belly up to this bar island that gives you a built-in excuse for entertaining—the wine fridge located conveniently nearby. Behind and below the granite countertop are the sink and dishwasher, which keep the pile of dirty dishes and wine glasses cleverly contained and hidden away. 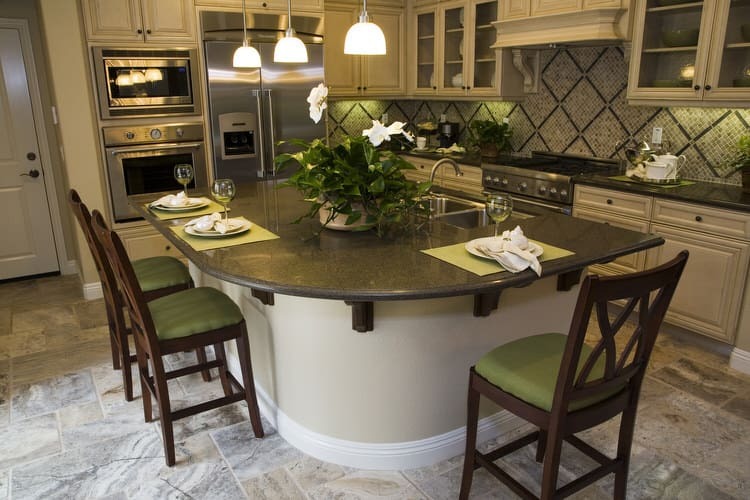 Don’t forget to include island seating in your kitchen design plan. 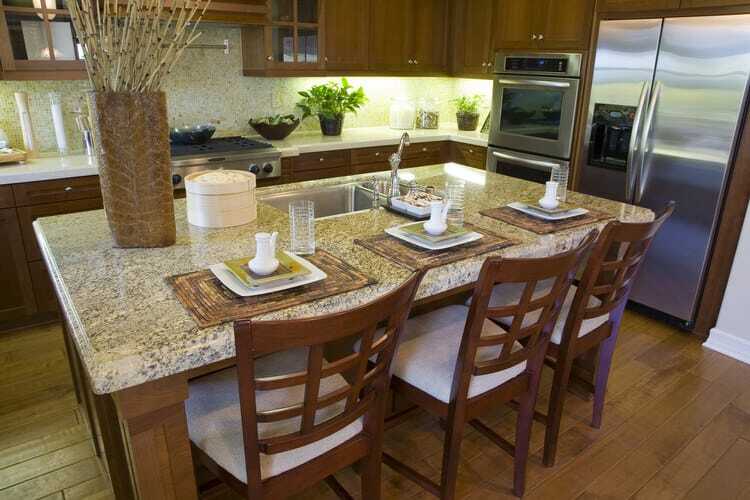 The generous proportions of this island make it ideal for casual dining and informal family meals. Choose metal or wicker stools that coordinate with the wood but add another texture to the kitchen. 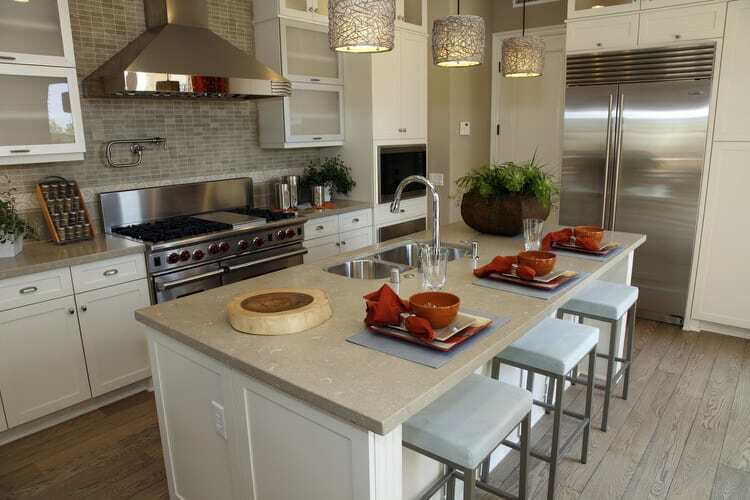 This span of island comfortably accommodates three bar stools. This freestanding open island is all about the storage and looking good. 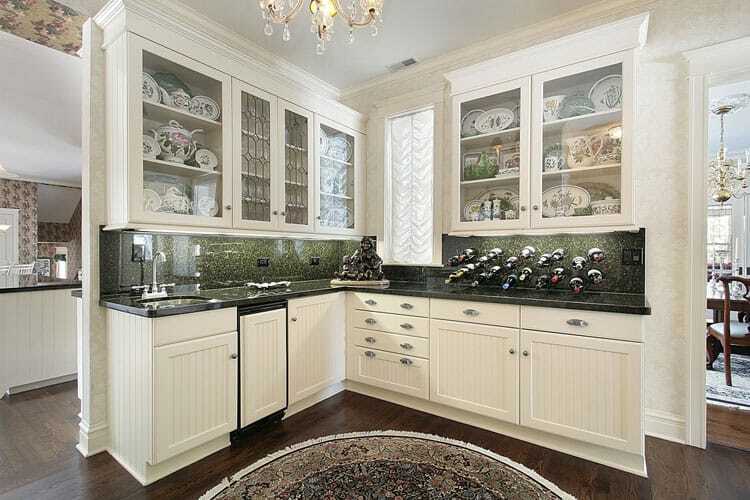 The open shelves below are perfect for stashing extra everyday dishes, cookware, appliances and linens. 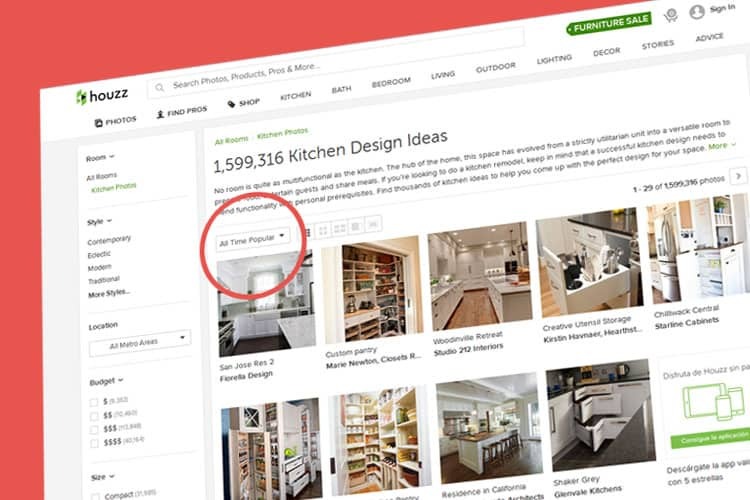 Resist the urge to clutter the counter. In this case, less is more. 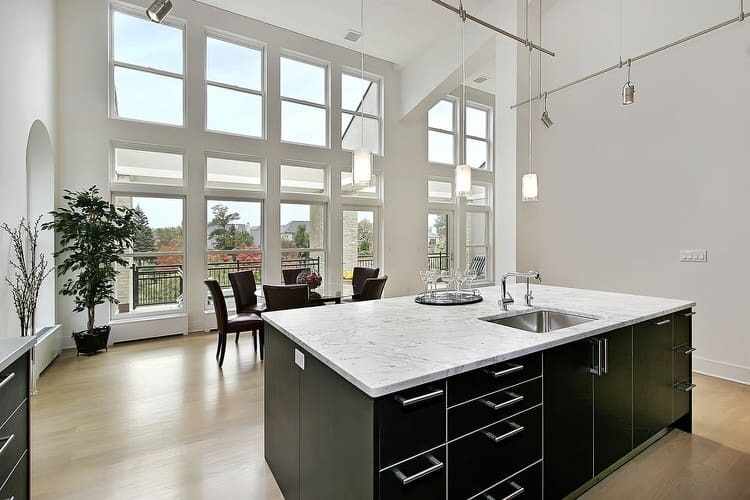 This modern industrial kitchen design maintains a minimal perimeter by locating the 6-burner gas range and artistic hood vent within the kitchen island. 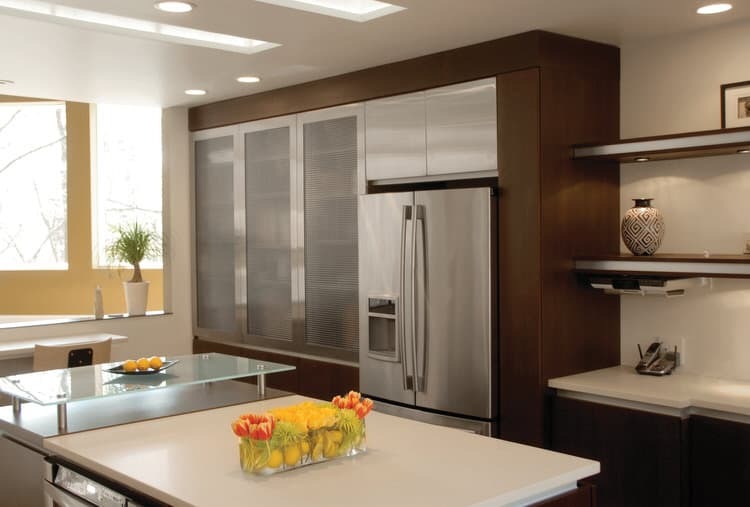 The designer wanted to have multiple windows in the space and keep an open feel by avoiding upper cabinets. A sophisticated island is the showpiece of this mid century modern kitchen. The streamlined custom unit artfully divides the kitchen from open living spaces. The suspended lighting and ventilation system ups the ante by spanning the entire length of the island. 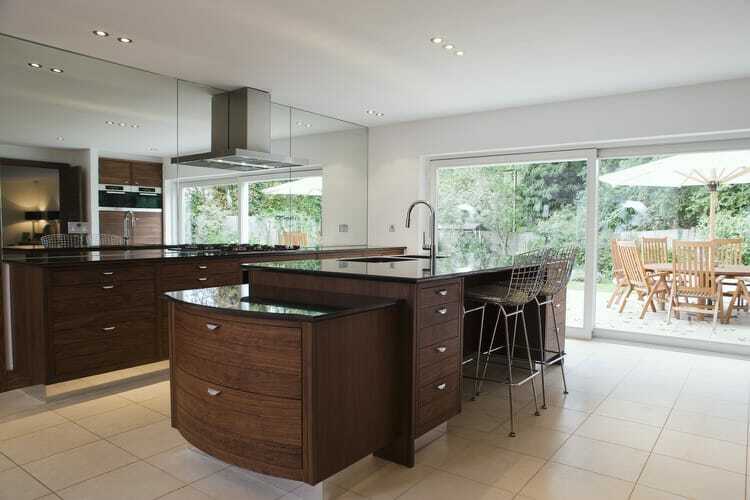 The clients wanted a bright Scandinavian modern kitchen and their designer delivered the goods. 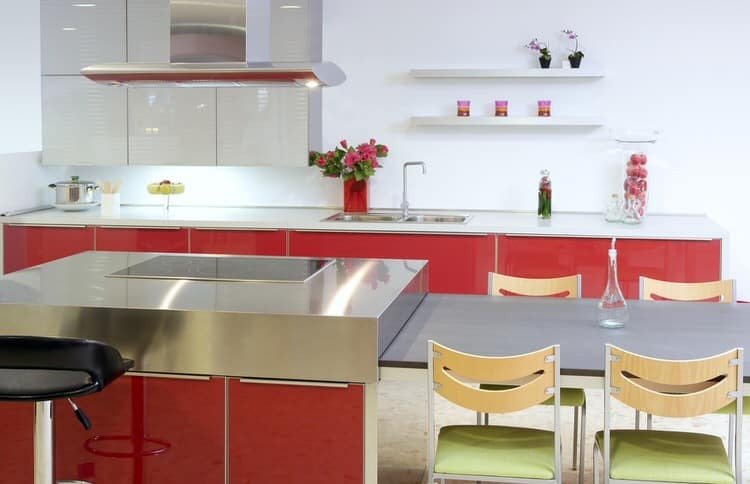 A stainless and red enameled island is the place for cooking and conversation. The granite cantilever table seats four guests on cheery birch and apple green upholstered chairs. Welcome to this medieval kitchen with its matching island. 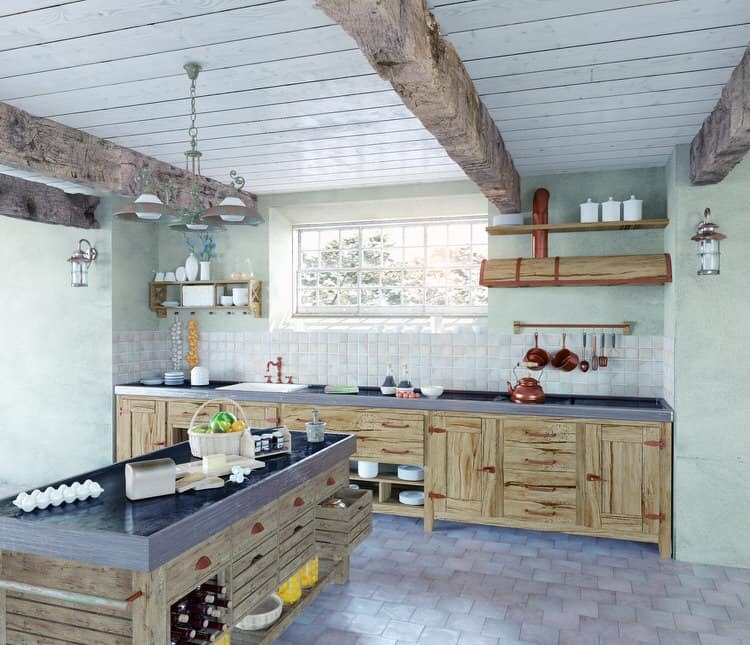 Utilitarian for sure, ye olde English design uses a combination of rustic wood for the base and a chunky concrete work surface designed to handle any kitchen task. 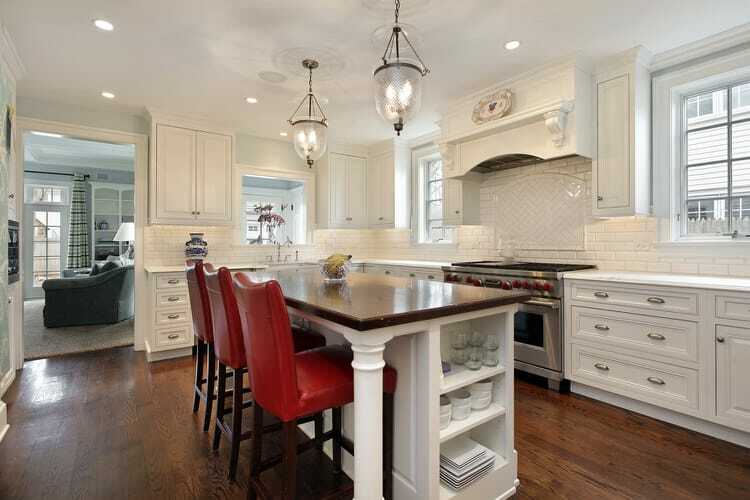 Notice how the island runs perpendicular to the main row of cabinets, This arrangement allows for good flow and the possibility to add an eat-in seating area. 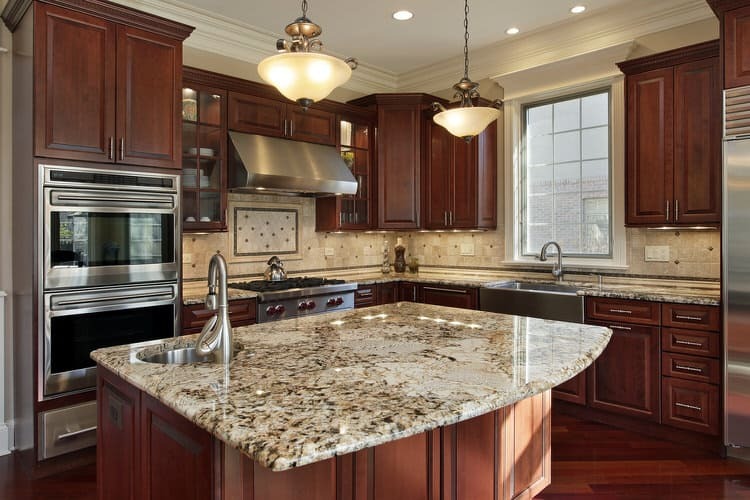 The design of this island is surprisingly simple, which makes it an economical and popular choice in new home construction. The base consists of typical framing and drywall construction. 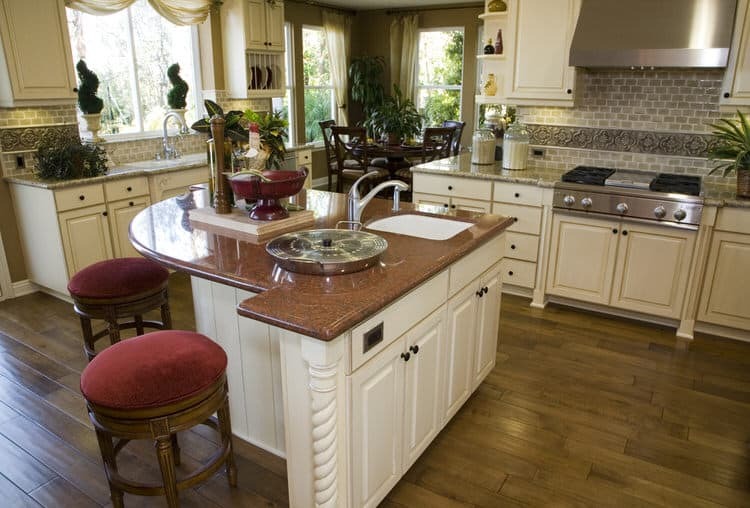 The work surface is a stylish and beautiful quartz composite accented with decorative corbels under breakfast counter. This kitchen is part of an open-concept layout visible from both the dining and living areas. For this reason, the owners decided to go with a formal look, featuring this custom island in a contrasting dark finish. The curved counter with its beveled edge provides additional seating. The rush seat stools are an unexpected, rustic touch in this traditional kitchen. Some kitchen islands are used solely as prep areas to slice, dice and chop vegetables before cooking. 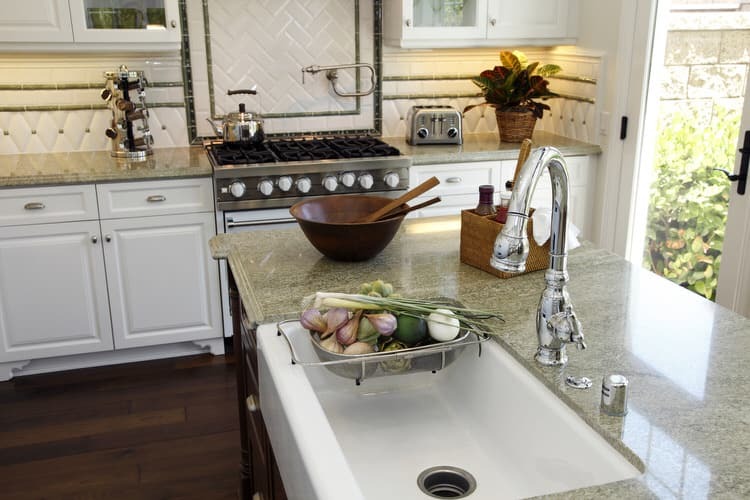 They will typically have a prep or bar-style sink to handle these smaller tasks. The purpose of this island is strictly clean up. 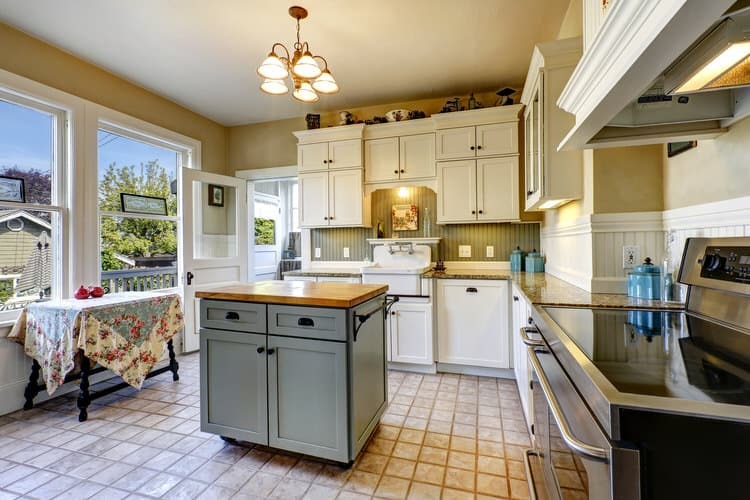 Fitted with a deep cast iron farmhouse sink, this island can handle the largest of your after dinner pots and pans. A curved kitchen island visually softens the hard lines of a boxy kitchen. 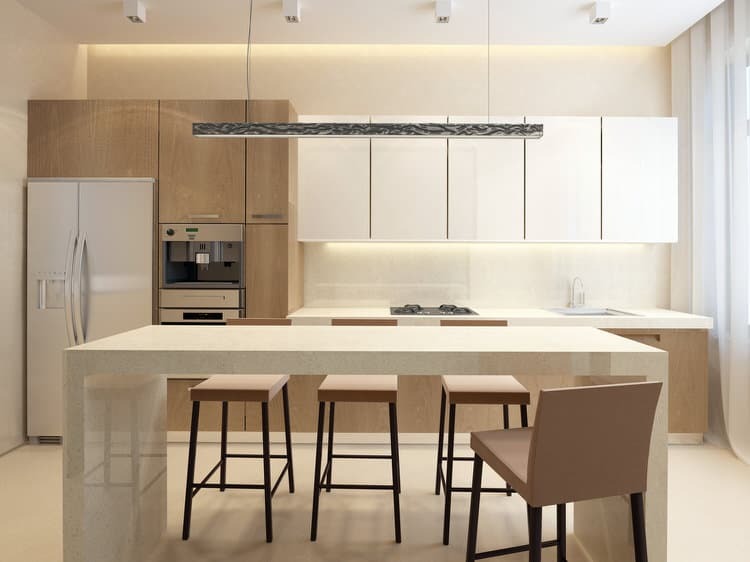 Its off-white finish, twisted rope detail and rich granite top make this island a highlight of the space. The round velvet counter stools reinforce the shape of the island. 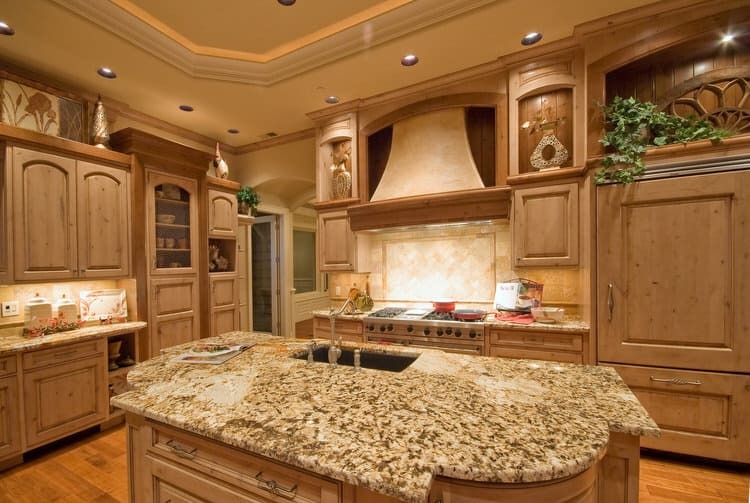 If your kitchen can handle it, go big with an unusually shaped island. This 5-sided pentagon mirrors the footprint of the kitchen. It is large enough to seat three guests on one side and still provide enough workspace for the cook, leaving enough room for serving dishes on the other sides. The rich hues of this granite island are just what the designer ordered to complement the Mediterranean feel in this open-concept space. 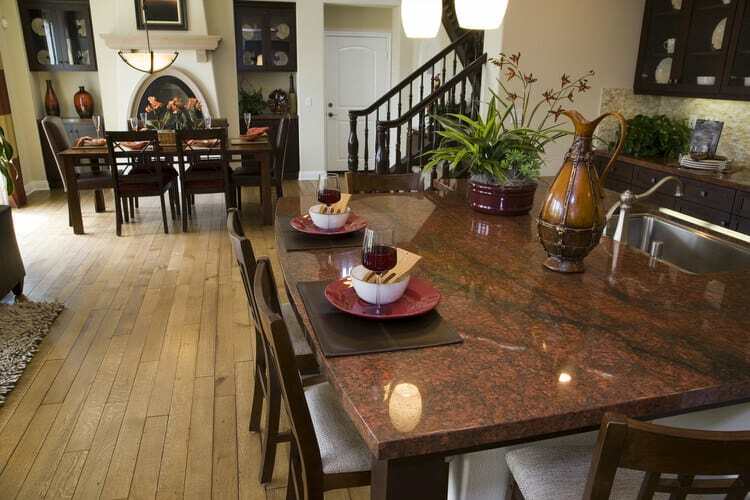 The island provides a splash of rich color against dark wood finishes and light wood flooring. Its classic seating configuration accommodates workaday family meals and casual entertaining. The island takes up most of this kitchen’s limited space but manages to make the most of it. 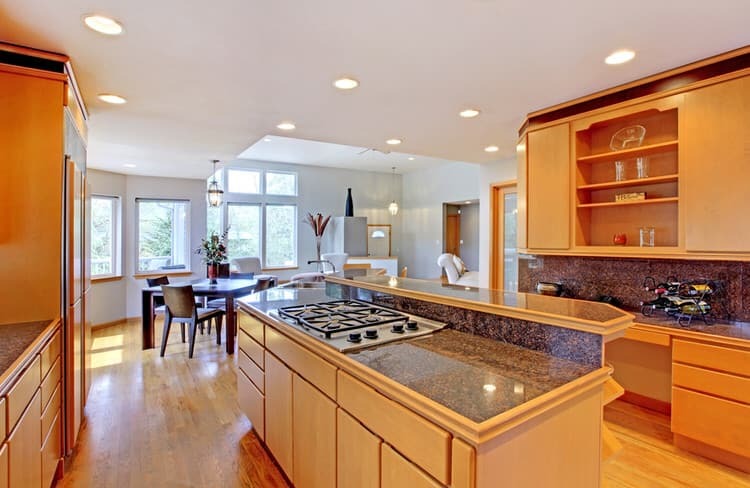 Every point along the perimeter counter is reachable from this multipurpose island. 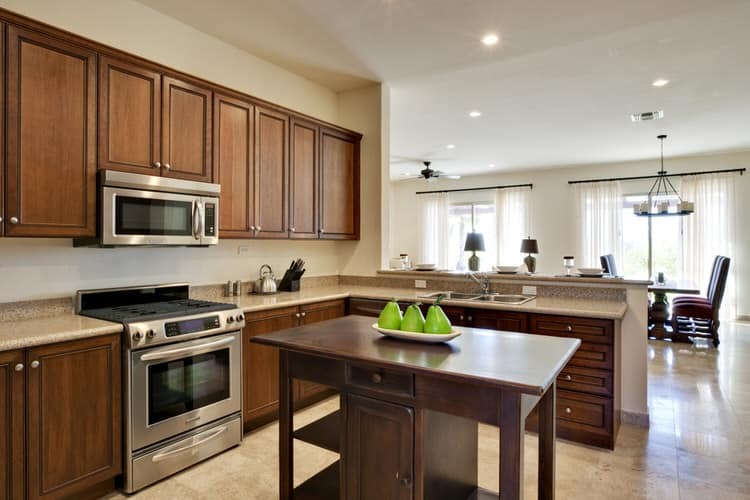 Delectable dishes directly from the ovens or cooktop can be placed right on the island for quick serving. And cleanup is a breeze with the integrated sink and dishwasher within arm’s reach.